This week, the House Science Committee introduced and approved three bipartisan bills. One authorizes Department of Energy Office of Science programs. A second reauthorizes and broadens the mission of the Advanced Research Projects Agency–Energy — an agency that committee Republicans had not previously backed. A third provides national laboratory directors authority to enter small public–private partnerships without prior DOE approval. 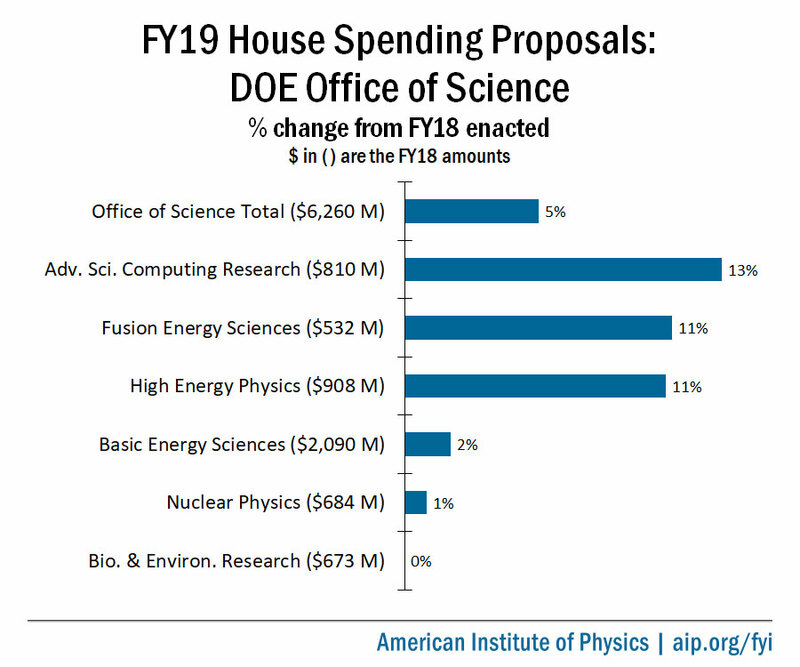 The House Science Committee approved three bipartisan bills by voice vote on May 23 that provide congressional backing to Department of Energy science programs. The centerpiece of the three bills, the “Department of Energy Science and Innovation Act,” reauthorizes the DOE Office of Science as a whole and includes detailed policy for its research program offices and current construction projects. A second, the “ARPA-E Act,” renews the legislative authorization for the Advanced Research Projects Agency–Energy. The bill’s approval marks a turnabout for committee Republicans, who did not back an ARPA–E reauthorization bill that committee Democrats introduced last year. A third bill, the “National Innovation Modernization by Laboratory Empowerment (NIMBLE) Act,” authorizes DOE national laboratory directors to approve public–private partnership agreements entailing financial obligations of less than $1 million. The future of ARPA–E has been a major bone of contention for more than a year. In two straight budget requests, the Trump administration has proposed terminating the agency, which supports risky but potentially transformative R&D, while supporters have rallied to protect it. In their fiscal year 2018 spending bill, House appropriators agreed to zero out ARPA–E’s budget, purportedly at the Science Committee’s request. Ultimately, though, strong bipartisan support in the Senate led to it receiving $353 million, the largest annual appropriation in its history. Now, the previous pockets of congressional support for terminating the agency have disappeared. In their fiscal year 2019 spending legislation, House appropriators joined their Senate colleagues in recommending robust funding for ARPA–E. And, with the “ARPA–E Act,” the Science Committee is making clear that it also wants the agency’s work to continue. I understand some of my majority colleagues have not always been the biggest supporters of ARPA–E, but after years of successes and several independent assessments praising the agency’s work, we are finally passing a bill out of this committee reauthorizing this now-vital component of our energy pipeline. He also outlined reservations that many Republicans have had about ARPA–E, such as that it replicates functions of DOE’s much larger Office of Energy Efficiency and Renewable Energy and that it funds projects that could access private capital or that other federal agencies are already funding. I believe that, while these are valid concerns, ARPA–E is a program that can and has had tremendous impact on the development of new energy technologies. Over 10 years after its establishment, the bill we will consider today will both address these concerns and enable ARPA–E to apply its innovative approach to a broader set of technology challenges. Specifically, the legislation revises the mission of ARPA–E to extend beyond energy technology to encompass “transformative science and technology solutions to address energy, environmental, economic, and national security challenges.” Lucas and Johnson both noted that the agency would be able to support projects addressing DOE’s nuclear waste cleanup activities. In addition, the bill directs ARPA–E to coordinate with other DOE programs to avoid duplication of effort, and it shields funded organizations’ proprietary information from public records requests. It also requires ARPA–E to develop “strategic vision roadmaps” for its investments and to undergo a new evaluation by the National Academies within three years, updating the evaluation released last year. The “Department of Energy Science and Innovation Act” provides authorization for the DOE Office of Science and its program offices: Advanced Scientific Computing Research, Basic Energy Sciences, Biological and Environmental Research, Fusion Energy Sciences, High Energy Physics, and Nuclear Physics. Together, these offices support a research portfolio with a budget of over $6 billion. The bill’s authorizing language is similar to that included in the “Research and Innovation Act,” a bipartisan bill the committee advanced last year. That bill now only requires passage on the Senate floor before going to the president. The principal difference between the bills is that the earlier one refrained from including budget authorizations, which convey the committee’s view of programs’ appropriate scale but do not guarantee funding. The “Science and Innovation Act” authorizes topline levels for fiscal years 2018 and 2019 for the Office of Science and its program offices. The amounts for the current fiscal year are equal to those already appropriated, while the amounts for next year largely map onto those proposed in the House’s appropriations legislation released earlier this month. A delegation of House Science Committee members visited Argonne National Laboratory and Fermi National Accelerator Laboratory in Illinois earlier this month. In this photo are, left to right: Science Committee Staff Director Emily Domenech, committee staff member Jimmy Ward, Fermilab project director Lia Merminga, and Reps. Andy Biggs (R-AZ), Randy Weber (R-TX), Frank Lucas (R-OK), and Bill Foster (D-IL). Before joining Congress, Foster was a particle accelerator designer at Fermilab. The bill also includes target completion dates and funding authorizations for fiscal years 2018 and 2019 for a variety of construction projects at DOE national laboratories. The amounts are nearly identical to those included in the science infrastructure legislation that the House passed in February. However, the new bill also includes authorization levels for the France-based ITER fusion energy project, including $50 million in cash contributions for both years. Science Committee Chair Lamar Smith (R-TX) has recently been advocating that the U.S. resume honoring its full obligation to the project. Compared to the other two bills that the committee approved, the “NIMBLE Act” is comparatively narrow in scope. According to its sponsor, Rep. Randy Hultgren (R-IL), it will shorten the timespans required for national laboratories to enter into partnership agreements. The bill joins other bipartisan bills currently pending in both chambers of Congress that are designed to enhance DOE and the national laboratories’ ability to work with industry. The “Energy Technology Maturation Act” would authorize a program that provides funding to national laboratories to facilitate the commercialization of new technologies. The “IMPACT for Energy Act” would direct DOE to establish an independent foundation that would accept and channel funding from private donors for innovation initiatives. In recent years, Republicans and Democrats on the Science Committee have been sharply divided over issues such as climate change and the use of science at the Environmental Protection Agency. The passage of the DOE legislation, and particularly the ARPA–E bill, continues a recent movement toward more bipartisan compromise. Notably, the three DOE bills that the Science Committee advanced this week come one month after the committee approved a major authorization bill for NASA. Although the NASA bill originally split committee members along party lines, a last-minute agreement to authorize funding for the Earth Science Division at currently enacted levels secured bipartisan support for advancing the legislation. After voting on the bills, Smith announced that 28 of 32 bills the committee has approved during the current Congress are bipartisan. “That’s as good as it gets,” he said.